Untitled (Reflection) | Mumbai | oil on board | 120.3 x 72.4 cm. George Keyt didn’t start painting until he was 26, but he quickly went on to become an international giant of Modern art and arguably Sri Lanka’s most celebrated 20th Century artist. His unique visual idiom combines European Modernist innovations with the ancient South Asian fresco techniques found at Ajanta and Sigiriya. Desipite his clear admiration for cubist and fauvist principles, his subject matter was almost always rooted in local tradition, depicting dancers, shepherdesses and gods, often drawn from Hindu and Buddhist mythology. 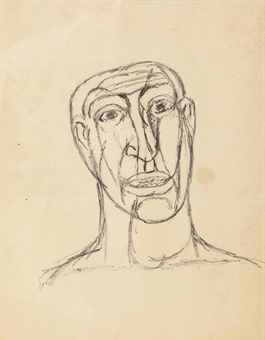 His subjects’ enlarged, almond-shaped eyes are, perhaps, his most consistent stylistic signature, along with an emphasis on bold, crisp lines and a prolonged romance with cubist perspective (his work has been exhibited alongside Picasso and Braque in galleries around the world). His earliest work was distinctly Gauginesque—sumptuous pastorals and figure studies free from overt perspectival abstraction, populated by luxuriant nudes and semi-nudes swaddled in robes, limbs graceful and provocatively intertwined. 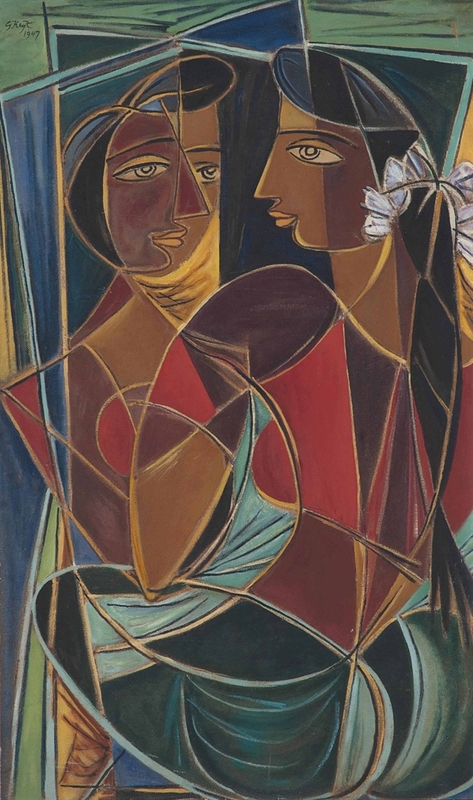 By the early 1930s, the cubism that would forever alter the character of his paintings began to emerge in his work. Still, Keyt perpetually re-invented his craft, adopting and discarding countless subtle variations in style across seven decades. His famous black-and-white line drawings depicting Sri Krishna and his lover have been reprinted millions of times since he made them in 1947. Keyt was Sinhalese-Dutch by birth and lived in his native Sri Lanka almost his entire life. He wrote poetry in English and converted to Buddhism as a young man. In 1978, he lived in London for six weeks where, according to his obituary in The Independent, he “visited many museums and art galleries, went to Stratford-upon-Avon to see Shakespeare, called at the Ashmolean Museum in Oxford, and made a pilgrimage to Gadds Hill to see Charles Dickens's house.” He married three times and died in Colombo at the age of 92. At 82, is Arpita Singh ‘the next really big thing’ in Indian art?